The Royal Australian Navy, RAN, established three large oil tanks in a disused quarry at the corner of Newmarket Road and Lutwyche Road at Windsor, Brisbane during WWII. Fuel was gravity fed via a pipeline to Newstead Wharf. 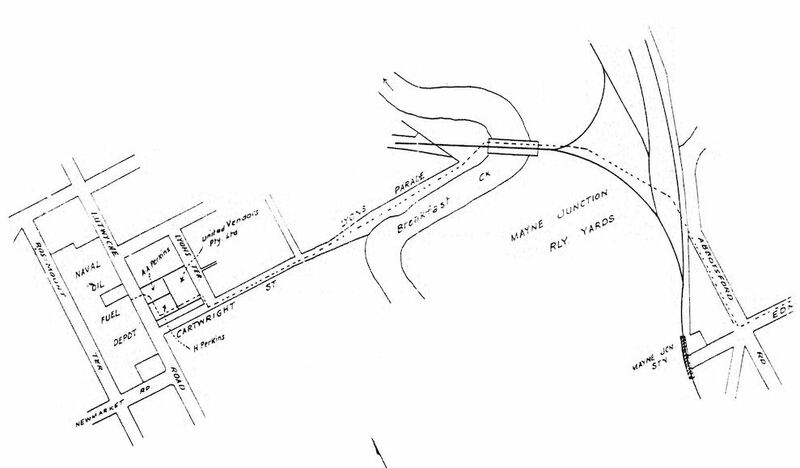 Part of the underground 13 inch pipeline ran along Lutwyche Road. There is a file in National Archives referring to repairs to a corroded section of this pipeline in Lutwyche Road. The land at Windsor was compulsorily acquired on 16 November 1939 from W. H. Bowser & Lever who owned the Windsor Quarry. 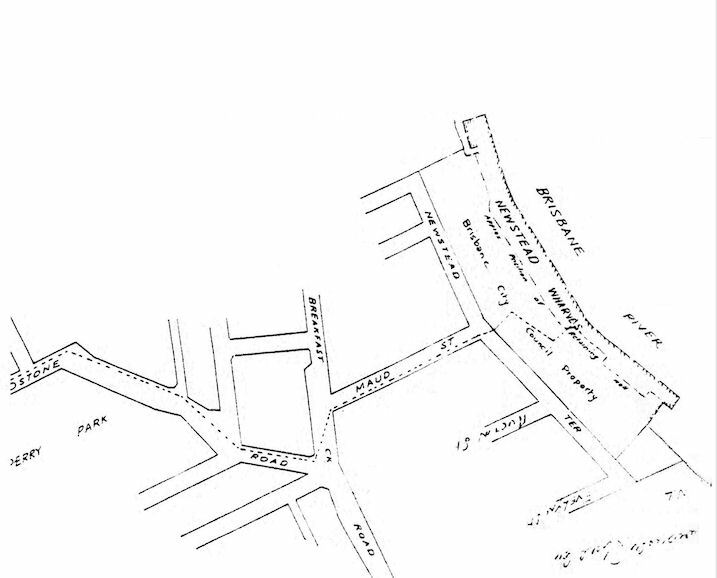 W. H. Bowser & Lever had started quarrying at the Brisbane Hospital site in about 1885 and in 1920, they opened the Windsor Quarry on the corner of Newmarket Road and Lutwyche Road. They were not able to buy all the allotments in the block. Mrs France would not sell, so W. H. Bowser & Lever quarried around the house". Mrs France’s reluctance to sell to Bowser & Lever was because she & Mr Pickup, her business partner, operated a lucrative gambling business there. The place even moreso thus became a veritable fortress accessible only from Lutwyche Rd (source: Kevin Murtagh's uncle who had “word-of-mouth” knowledge). The Minister for Supply told the Leader of the Opposition, Senator Collings, in the Senate on 30 November 1939, that £60,000 had been allowed for the completed works to provide oil storage at the site. Allen Henry Blake was in the Civil Constructional Corps CCC, and after some training in Melbourne his group travelled by train for Brisbane, picking up extra men along the journey. They camped at Camp Chermside with other Allied soldiers. They were trucked to the former quarry site on Lutwyche Road and installed the footings for the new oil tanks. 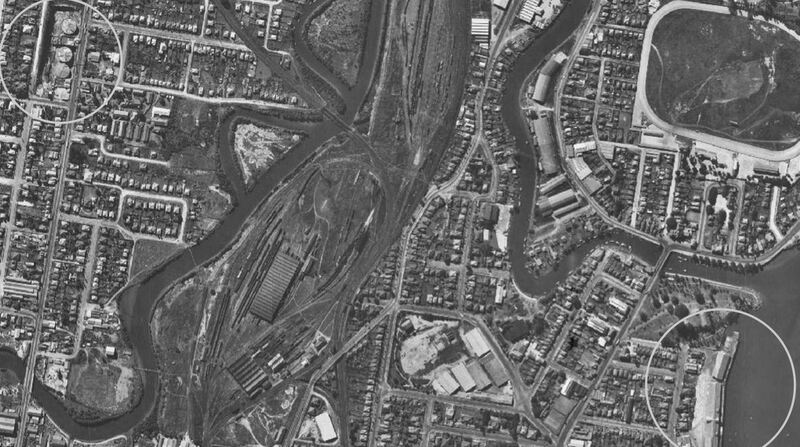 and the location of Newstead Wharves at the bottom right of the photo. Abbotsford Road and turning left into Edmonstone Road. The route is continued on the next Plan below. The top of the fuel tanks were level with Lutwyche Road and Elizabeth Galloway told me that during the war there were nets from the outer rim of the tanks to the footpath for camouflage and that there were imitation tennis courts painted on top of the tanks. The Air Raid Precautions Shelter (Air Raid Bunker), the camouflage netting and the blast walls were removed after the war, possibly in 1946. The Queensland Maritime Museum has the register for the Windsor Naval Oil Fuel Depot which runs from 1 July 1940 to 31 December 1945. During that period the oil fuel tanks refuelled 498 different ships, some of them many times. The first tank (No.3) was filled from the Norwegian tanker TEDDY between 3 and 5 July 1940. TEDDY brought another load on 5 & 6 August 1940 to fill No.2 tank. No.1 tank was filled from another Norwegian tanker, SOLHEIM, from 11 October 1940. The first refuelling was made on 16 August 1940 to HMAS MORESBY. Four of the warships that fought in the Battle of the Coral Sea came direct from the battle to Brisbane and were refuelled at Newstead Wharves from these oil fuel tanks between 10 and 14 May 1942. They were HMAS HOBART, USS WALKE, HMAS AUSTRALIA and USS HENLEY. 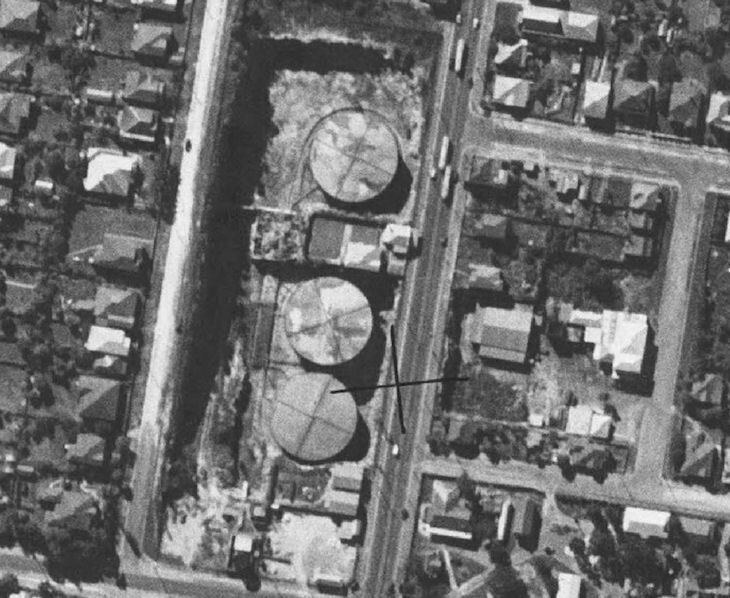 The three oil tanks can be clearly seen in this 1946 aerial photo. Lutwyche Road is running top to bottom at the right of the tanks. The tanks were finally emptied by HMAS SUPPLY in 1972, by which time the RAN had converted their fleet such that furnace oil was no longer required. The site has since been filled in and is now a Homemaker Shopping Centre. I'd like to thanks Elizabeth Galloway, Kevin Murtagh, Norman Love and David Jones for their assistance with this web page. I'd like to thank Bruce R. Blake, son of Allen Henry Blake, for his assistance with this web page.